If you’re anything like me, you need a bit of motivation to be able turn off the computer and get some fresh air. In a small moment of euphoria – or insanity, I’m not quite sure yet – I’ve decided to start running and improve my physique. Now due to a complete lack of discipline, I figure I need a social network to act as a support team and generally give me a prod whenever it’s time to lace up. Nike+ is great, but also very expensive. Although access to the website is free, it has little to no functionality if the user doesn’t already own a FuelBand or SportWatch GPS. The app on iPhone/iPod touch alleviates some of these problems, but Nike is still yet to release a version for Android or Windows Phone 7. Finding a cheap alternative is tricky. Half-baked services such as GoGazella, Runners’ Lounge and Breaking the Tape feel dated or downright ugly. Dailymile is a step in the right direction, but by no means perfect. So what’s the solution? Here’s our pitch for what an effective running social network should look like. One of the biggest strengths of Wii Fit (Plus) – the incredibly popular video game on Nintendo’s current home console – is the ability to set yourself goals and targets. The game is very effective at challenging players to either lose or maintain weight by repeatedly coming back and completing various activities. A new social network for runners needs the same sort of infrastructure. 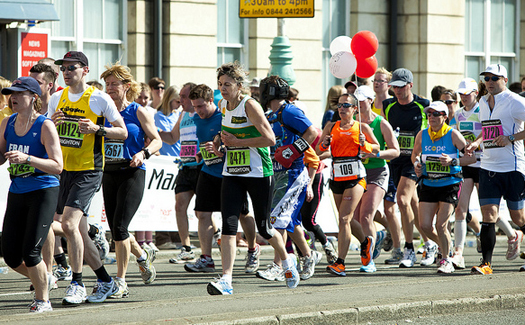 Let’s say your personal goal is to run the London Marathon next year. Or to be able to run 100 metres in less than fifteen seconds. A good web service should have the ability to build a schedule around this goal, ensuring that you complete it in a predetermined period of time. Reminders can be set for whenever you need to start a new run, and the schedule should be able to adjust itself if you miss a particular session. The strength of scheduling should also be coupled with a great mapping service. The Nike+ app does a great job of showing you exactly where and how far you’ve run, but it could be improved with better route suggestions. The perfect social network for runners should be able to offer new and creative runs tailored to your needs. Are you training for a mountainous, cross-country race? Ask the service to find a route which will incorporate at least three hills. Does it look like it might rain outside? Request an area where you’ll be less exposed to the elements. Popular routes used by other runners should also be easily accessible, and include best times for an added incentive. After all, a computer can only do so much. Despite my profound hatred for this word, I accept that it has its uses. If Foursquare can entice people to become “Mayor” for the week, it can also entice people like me to run more often. Give me experience points, level-ups and some kind of achievement system and I’ll be hooked for life. Completing a monumental task is always easier when you’re doing it with other people. An innovative social network should, in my opinion, be able to link you not only with your existing friends and family, but with new users that share similar interests. User recommendations should be based on who lives close to you, but also by looking at runners with a similar skill level. If your challenge was to run the London Marathon next year – but you had little to no experience of serious running – the journey could be made more competitive by linking you up with another user tackling the same goal. Runs and schedules can then be synced so that regardless of where you both live, you can compete with times and fitness levels. Groups could be used to similar effect. In each city there are dozens of running clubs for amateur and professional athletes alike. But before you splash out on membership fees, it would be useful to quickly look up how often they run, where they go and what their average skill level is like. Once you’ve joined a group, it would then also be much simpler to propose a new run, look at new routes and let people know whether you can attend the next meet using the service. As with any social network, a new Web service tailored specifically for runners would need to change based on the needs of its users. So come on developers, build us a platform to be proud of.